The soldiers, politicians and businessmen who ousted left-leaning President Manuel Zelaya are taking their battle from Honduras into the U.S. political arena, waging a lobbying campaign to paint themselves as a bulwark against "dictatorship" and "communism." Appealing to free trade supporters, they hope to nudge the Obama administration away from its threat to impose sanctions on the impoverished country, where export-assembly factories are dominated by U.S. firms and investors. "I imagine there would be some reaction from them" to trade sanctions, Amilcar Bulnes, head of the Honduran Council of Private Business, said Monday. The de facto government led by interim President Roberto Micheletti took pains to put together a lobbying effort that is diverse and representative. The team sent to Washington on Monday includes a Christian Democrat labor leader and a university law professor who is in an opposition party. Zelaya's foes appear to hope President Barack Obama doesn't have the time or energy for this battle when he has weightier problems like his push to reform the U.S. health care system and turn around the economy. 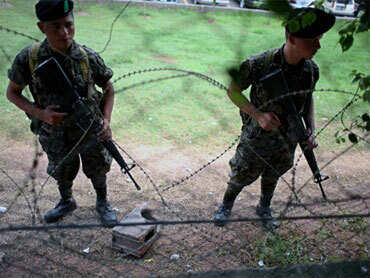 "Honduras is a small, poor country," Bulnes said. "The world would look very bad if it takes out its wrath on this country." The lobbying team left for the U.S. as Washington was turning up pressure on the Micheletti government by warning that Honduras could face severe economic sanctions if Zelaya is not restored to the presidency. U.S. Secretary of State Hillary Clinton called Micheletti on Sunday to say there would be serious consequences if his government keeps ignoring international calls for Zelaya's return - the key point that led to a stalemate in U.S.-supported negotiations over the weekend mediated by Costa Rican President Oscar Arias. Business executives say U.S. Ambassador Hugo Llorens has called them into meetings to warn that Honduras - heavily dependent on exports to the United States - could face tough sanctions if leaders continue to refuse Arias' compromise proposal for Zelaya to return as head of a coalition government. The U.S. Embassy said it would not comment on the meetings. The European Union added to the pressure Monday by announcing it was suspending $93.1 million (65.5 million euros) in aid to Honduras. The EU's external relations commissioner, Benita Ferrero-Waldner, called the standoff over Zelaya "a crisis which Honduras can ill afford." No government has recognized the Micheletti administration, and the United Nations and Organization of American States have called for the return of Zelaya, who was arrested and hustled out of the country by the army on June 28. Micheletti vowed not to back down - and implied that Washington is betraying a staunch ally, one that let its territory be used as a staging area for U.S.-backed Contra rebels battling Nicaragua's leftist Sandinista government during the 1980s and more recently sent troops to Iraq. "We feel abandoned by several friendly countries," Micheletti said in a speech to cheering supporters. "We are going to demonstrate ... that we have the strength to hold out until the last moment." Referring to Clinton's phone call, Micheletti suggested she send an envoy to Honduras to see that the government is not persecuting Zelaya's supporters, who have staged daily demonstrations demanding his return. Micheletti vowed to stay in power until a scheduled Nov. 29 presidential vote, which the United States has suggested it may not recognize if it is held under a de facto government. "We are going to go on with life, we are going to go on with our government, we are going to go on with the next presidential elections on Nov. 29," he said. "They have to respect us." Business leaders - a key sector of support for Micheletti - also vowed to tough it out, hoping the U.S. government is as wary as they are of Zelaya, who has aligned himself with leftist Venezuelan President Hugo Chavez, one of Washington's biggest antagonists in the region. Zelaya angered many people in Honduras by ignoring Congress' and the courts' objections to his effort to hold a referendum on changing the constitution, which many saw as an attempt to impose a Chavez-style socialist government. "We prefer sanctions to Zelaya's return," said Adolfo Facusse, head of the country's National Association of Industries. He said restoring Zelaya to power would bring the "loss of liberty, dictatorship, communism."